Abstract: Objective To explore the effect and mechanism of Toll-like receptor 4 (TLR4) on cerebral ischemia/reperfusion injury.Methods Rats were divided into a sham group, MCAO group, and MCAO+TAK group. Cerebral cortices were removed on day 1, 3, 7, and 14 post surgery. 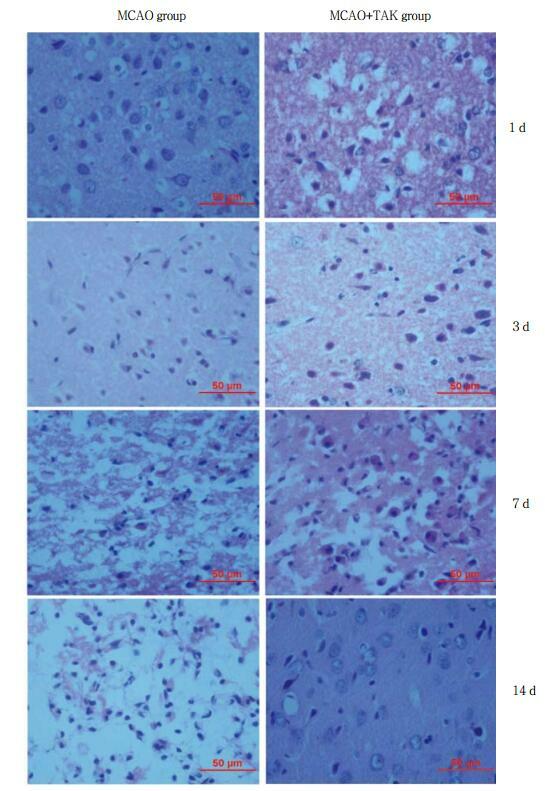 Morphological staining and Western blotting were used to detect pathological changes and TLR4 and PIKKα/β expression in brain tissues.Results The pathological changes in the MCAO+TAK group were more severe than in the MCAO group on day 1 post surgery. However, the MCAO group exhibited more severe damage at the other time points. 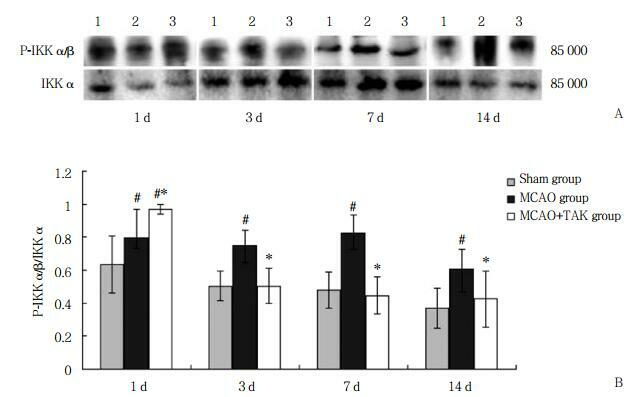 TLR4 expression was lowest in the cerebral cortices of the sham group. On day 1 and 14 post surgery, TLR4 expression was lower in the MCAO group than in the MCAO+TAK group, while on day 3 and 7 post surgery, TLR4 expression was higher in the MCAO group than in the MCAO+TAK group. 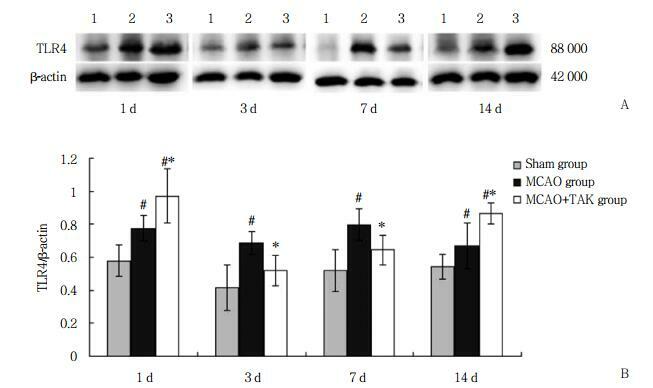 PIKKα/β expression was highest in the cerebral cortices of the MCAO group at all time points except for day 1.Conclusion TLR4 may alleviate cerebral ischemia reperfusion injury in rats on day 1 post surgery; however, TLR4 may exacerbate ischemia reperfusion injury 3 to 14 days post surgery. The mechanism may be due to the effect of PIKKα/β expression in the cerebral cortex.